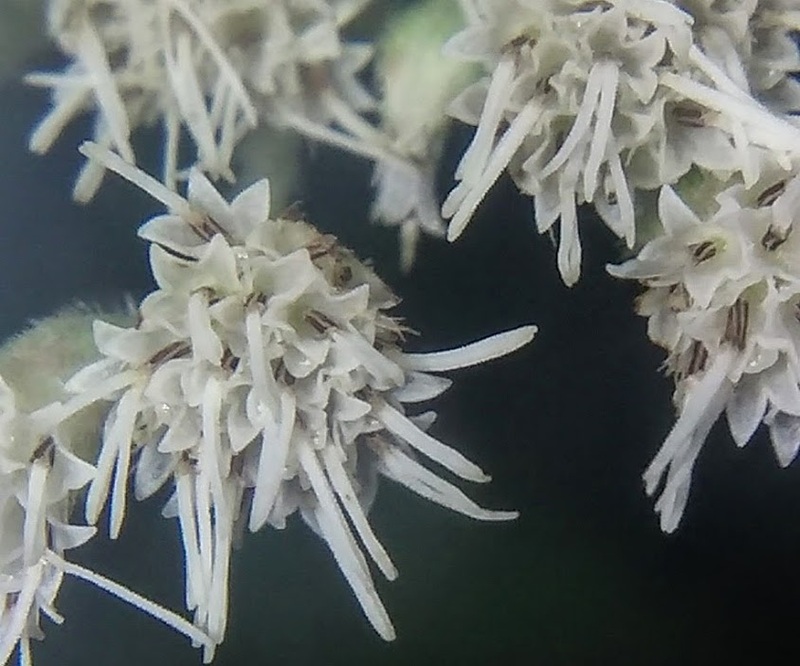 I bet you had no idea a Milkweed flower was this intricate. 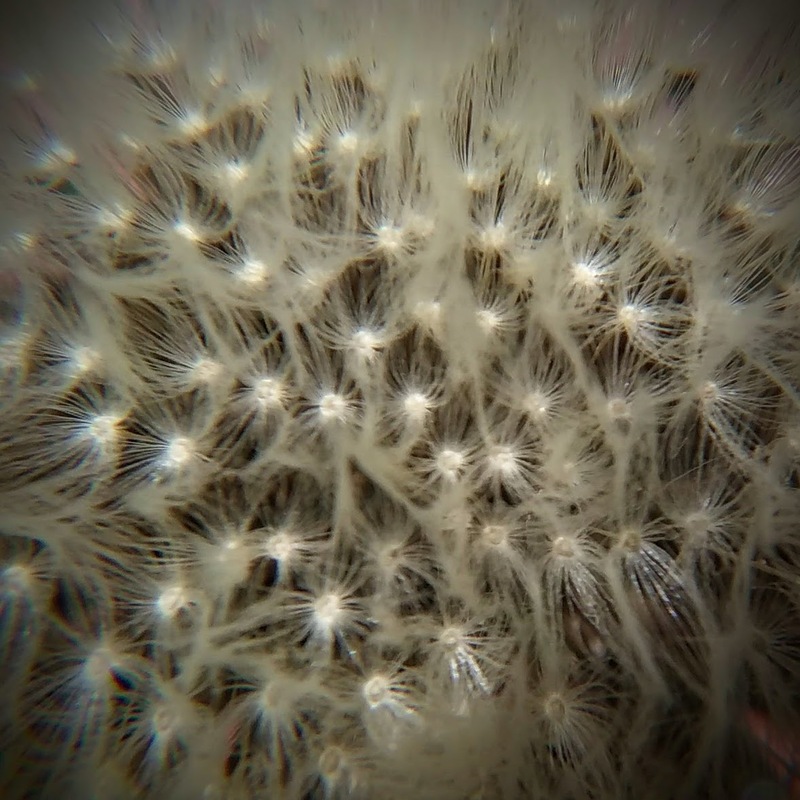 A simple Dandelion, well like so many other things we take for granted, isn’t so simple. 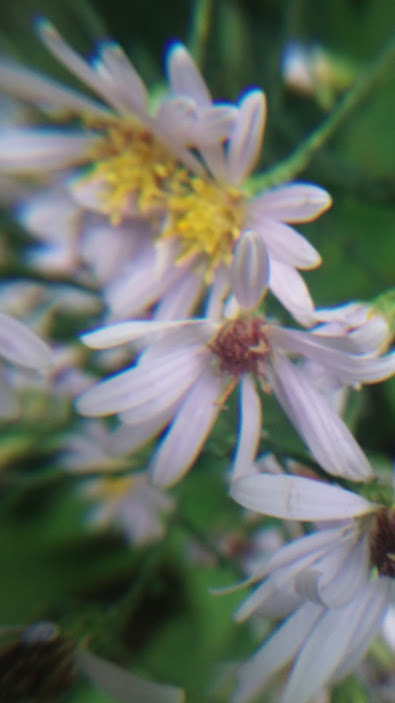 As an Aster, it is actually made up of many individual flowers each with its own reproductive organs. A collective in a sense. Each creating it’s own offspring in an effort to grow it’s community. Hidden in it’s common beauty are it’s secrets to life. Nutrition beyond the scale of modern hybrids, it is a scorned gift that should be celebrated in both it’s life sustaining qualities and its beauty. Other beauties hiding in plain sight. Those were just a few of the hundreds of photos taken last summer. There is calendar available on the products page. The year is still young so its not too late. Some Fun-gus (get it?) pics from last summer. 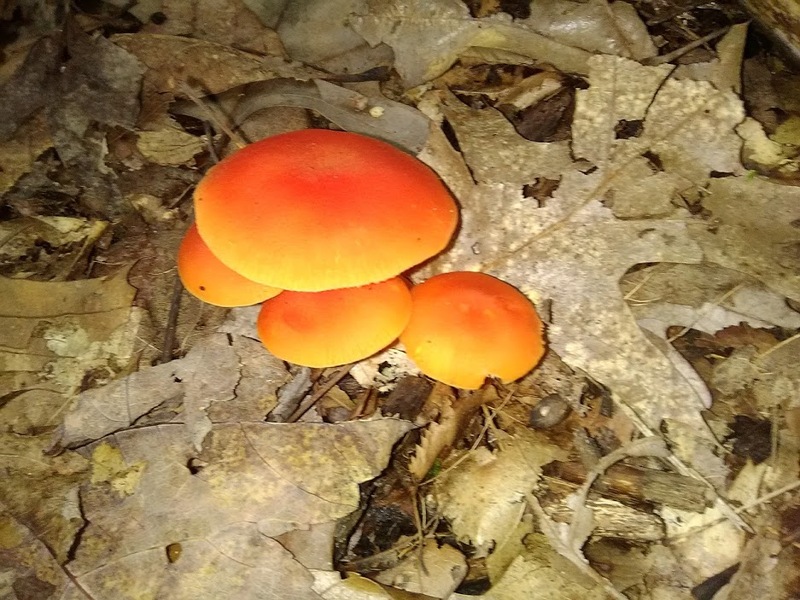 I won’t claim to be a Mycologist so if you know what these are exactly let me know in the comments below. 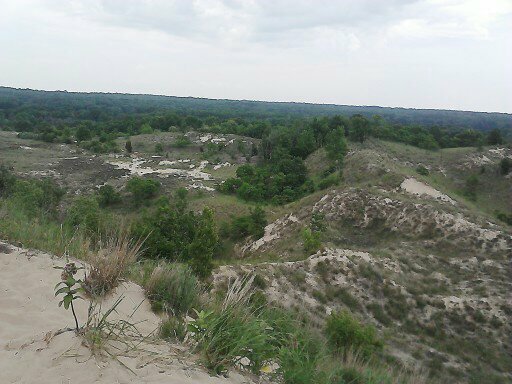 Sand Dune at Hoffmaster State Park. 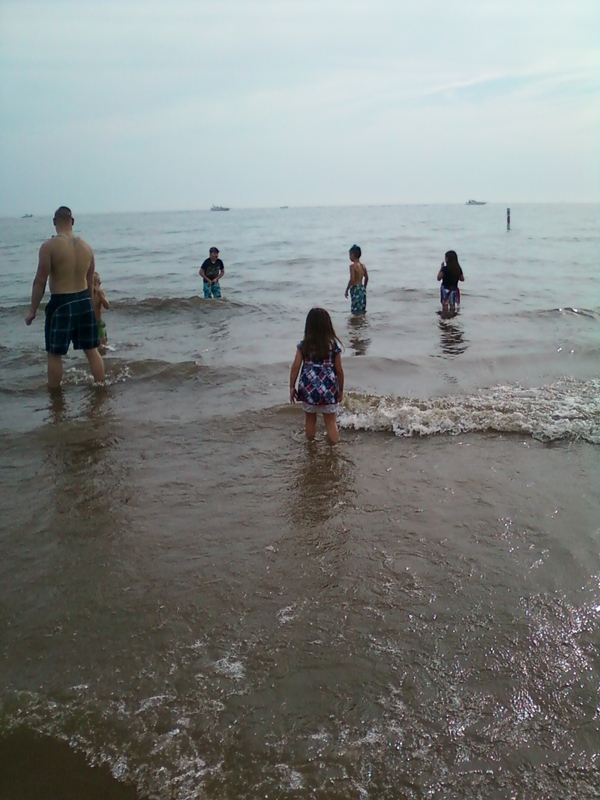 Beach at Hoffmaster State Park. Hoffmaster State Park by Muskegon is awesome. One of our favorite places. Improved trails take you on a walk along the East side of huge dunes. On the other side is Lake Michigan. 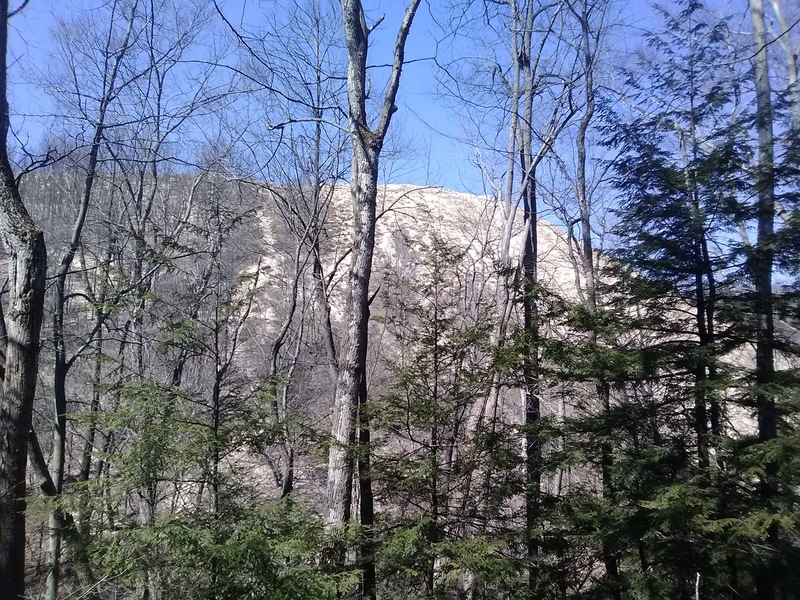 The trail takes you to the beech, but be advised, even though the trail is improved, it is quite the walk with steps. Right now the trail that goes to a beautiful over look is under repair. When its usable, there are a whole bunch of steps in which every one is worth taking. At the head of the trail is a visitors center with a couple amazing displays. Then, there is another parking area that has a shower and bathroom. A short and easy walk takes you to the beech. It’s only $10.00 a car or you can pay an extra $10.00 when getting your new car tags which allows the car entry for a full year at no extra cost. 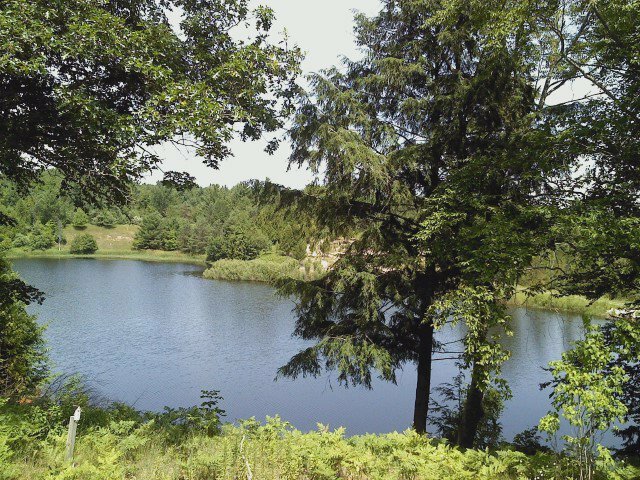 Take some time and visit Michigan’s State Parks. They are a great way to spend a day with the family. 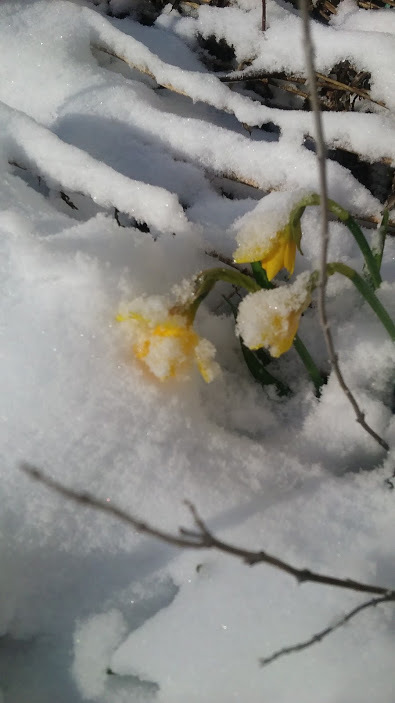 April snow, brings cold daffodils. 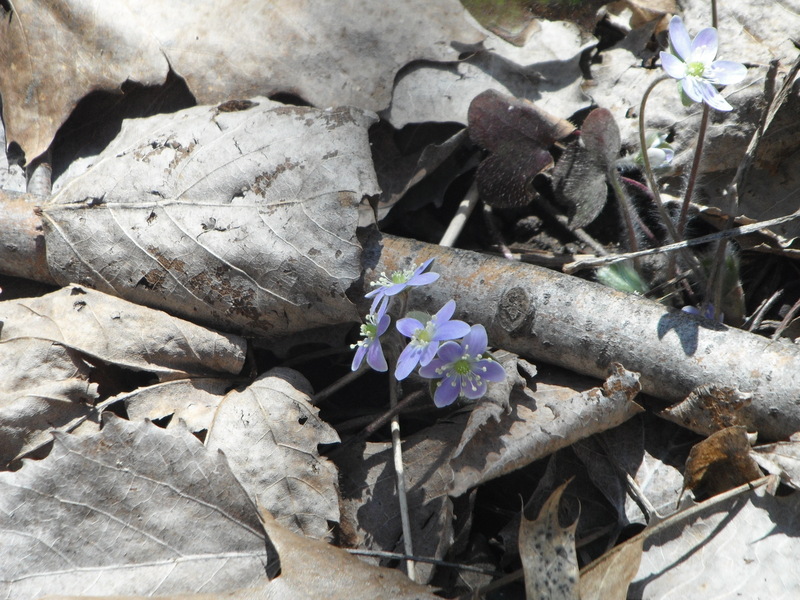 One of the first Spring flowers to bloom in mass is the common Purple Violet. Beautiful mats of purple and green is a very refreshing sight on April Fools Day. Back Yard Violets on April 1st 2016. Also it’s the Birth date of two of my Grandchildren. Yeh, what are the odds right? Shaun Avery and Nouvelle were born on the exact same day, one year apart! Well, anyway, not only are these Spring flowers gorgeous to look at, but they are good for you as well. 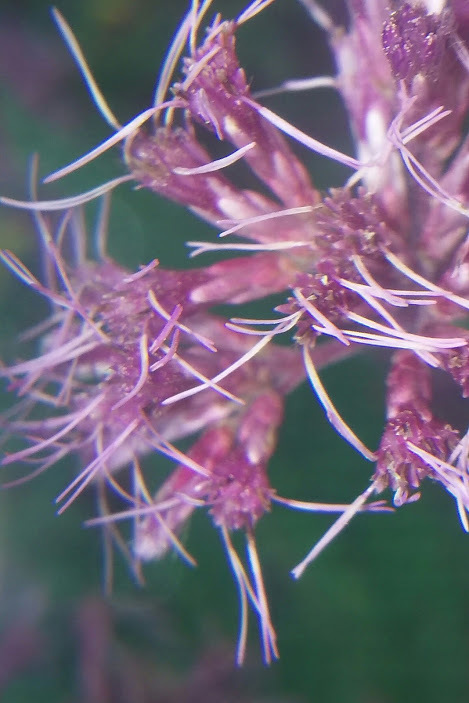 Use in a tea and salad or garnish a dish with the blooms. Just don’t eat the roots. They are mildly toxic and don’t taste great anyways. Blanding’s Turtles (Emydoidea blandingii) is a semi aquatic species so it isn’t unusual that they would be on land rather than in the water. 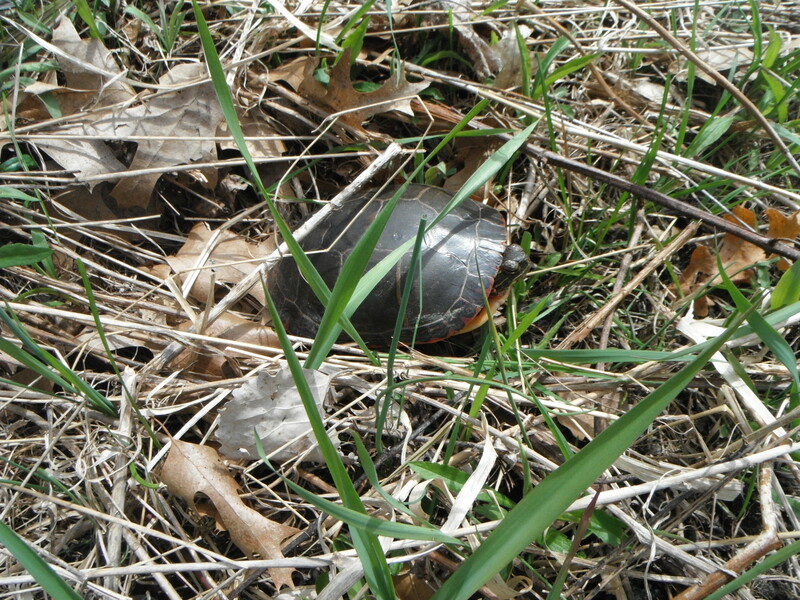 Blanding’s Turtle. Photographed in Northern Kent County on 04/17/2015. It’s a protected species and relatively rare. 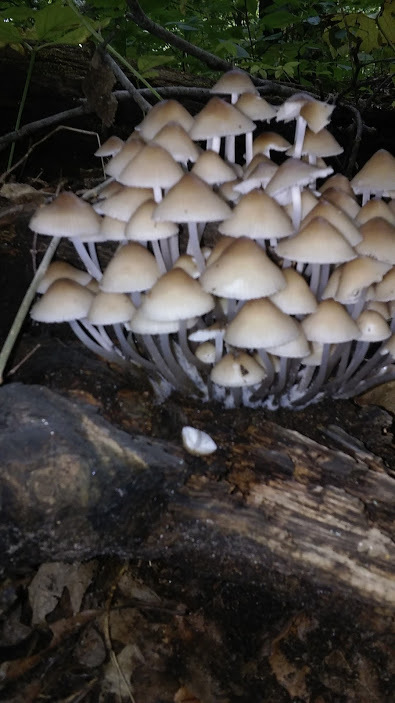 A cool find. They are more common in the Lower Peninsula of Michigan than in the Upper Peninsula where they are quite rare. They have a limited territory mainly in the upper Mid West around the Great Lakes. This was my back yard growing up. I know, rough, right? As you can see, I grew up in an area that influenced my appreciation for Nature. I was truly blessed. The lake has Large Mouth Bass, Northern Pike, Sunfish, Crappie and a few Perch. Plenty of forageable plants. Even with all that, I knew very little about what could and could not be consumed. We hunted and fished. We did collect Maple sap in the Spring and made Maple Syrup. That was awesome. We picked Morel Mushrooms but we also picked Beef Steak Mushrooms. That was a mistake. The toxins in the Beef Steak Mushrooms build up in you. You can eat them with no ill effect, then POW, you will wish you were dead. Just ask my brother. 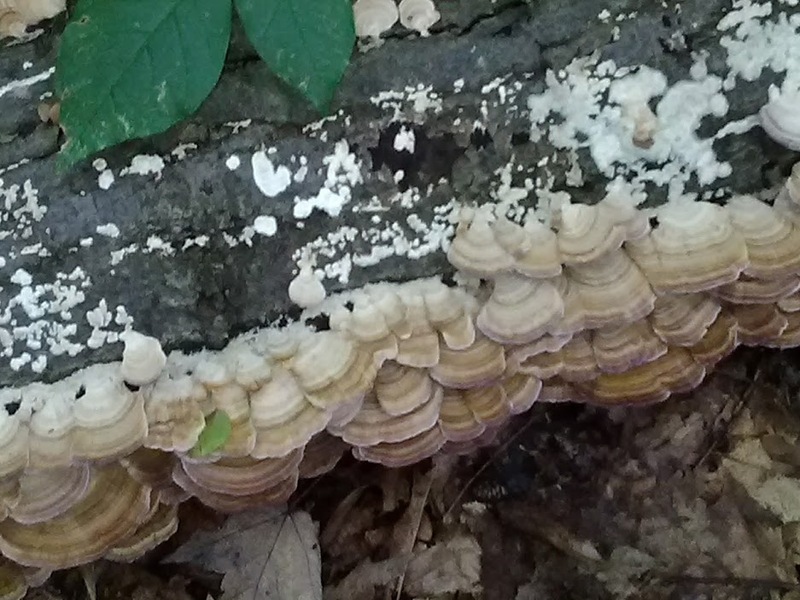 Now even the idea of eating a wild mushroom turns his stomach. Even the Morel, which is perfectly safe, makes him queezy just thinking about it. Thankfully, I don’t have that aversion and love “shroomin”. We also ate a lot of Wild Strawberries and Blackberries. As a note, we also ate some frog legs from the Bull and Leopard Frogs. Those were awesome. There was a time that we ate pretty much anything we could get a hold of. The early years of my Dads Construction business was slim pickens. So we fished, hunted and gardened to provide food for the dinner table. Not complaining though. It was good food and a good life. I do wish I would have known that so many nutritious wild edibles were all around us. It really would have helped. 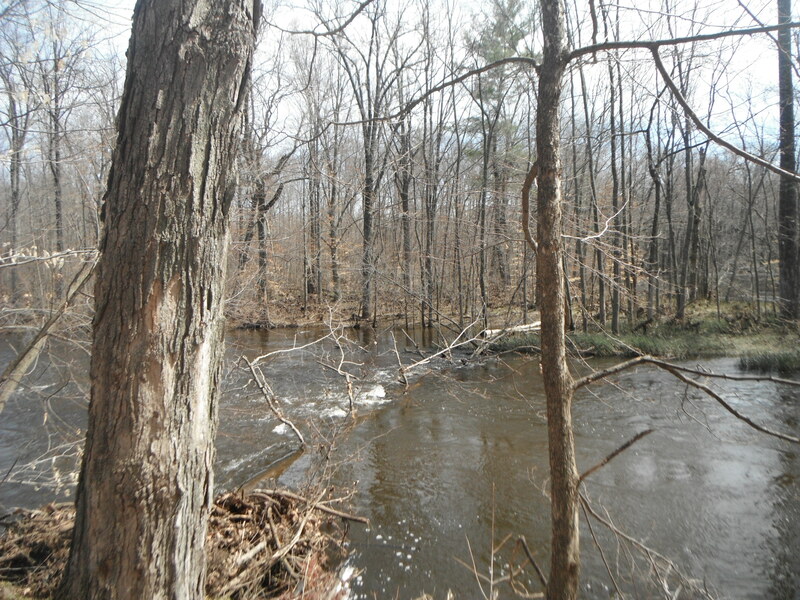 The Rouge River is a tributary of the Grand River. It gets good Steel Head and Salmon runs in the Spring and Fall, but they can only go as far as Rockford at the Dam. Above the Dam is a pretty good Trout Fishery. Brooks, Browns and Rainbows. I’ll be there on the last Saturday of April for the opener. This is also a nice Kayaking and Canoeing river. Put in at Friske Road and float it to the Rockford Dam. Beautiful! Do you want to go? Let me know. Lake Michigan at Hoffmaster State Park. Take advantage of our State Parks. They are well maintained. 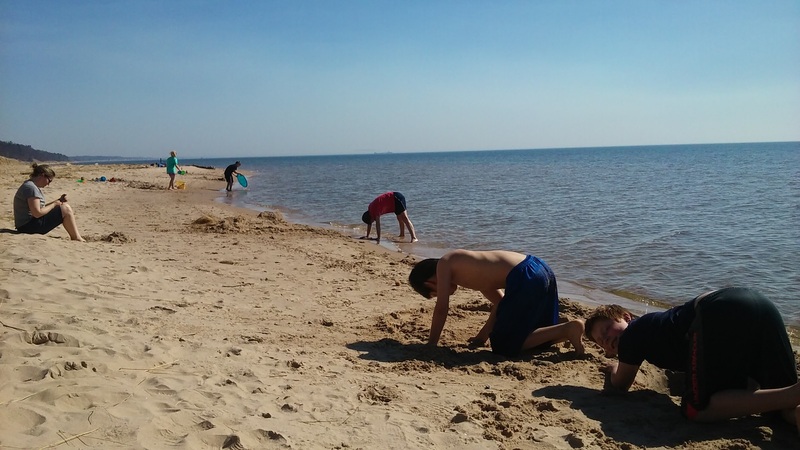 We really like Hoffmaster State Park in Muskegon where we enjoyed the Beach. They also have a great welcome center with live and mounted examples of the local wildlife. 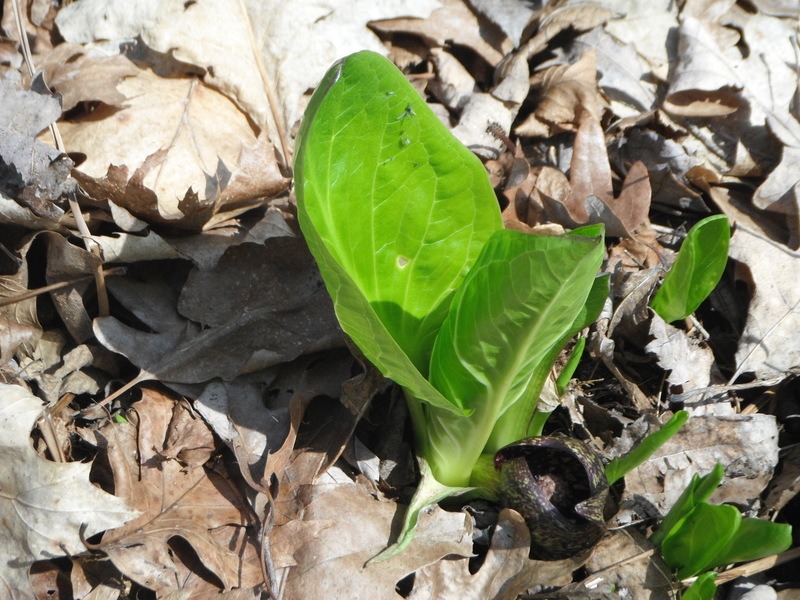 Skunk Cabbage in early Spring. There are sources that list the Skunk Cabbage (symplocarpus foetidusas) as an edible if you choose the proper parts and prepare it properly. I’m not adding it as an edible because there are too many nasty things that can go wrong if you don’t prepare it properly. So if you remember anything about this plant when afield, remember this; if you don’t prepare it properly the chemicals will burn your mouth, throat and intestines. It’s just too risky in my opinion. But it is a very cool plant. It comes up so early because it actually creates it’s own heat! Enough to melt the snow around it and allow for it to start growing while other plants are still dormant. Anyone can experience such beauty in Michigan. This is at a local park at Long Lake, just West of Cedar Springs. Go there in the off season and it is quite and peaceful. 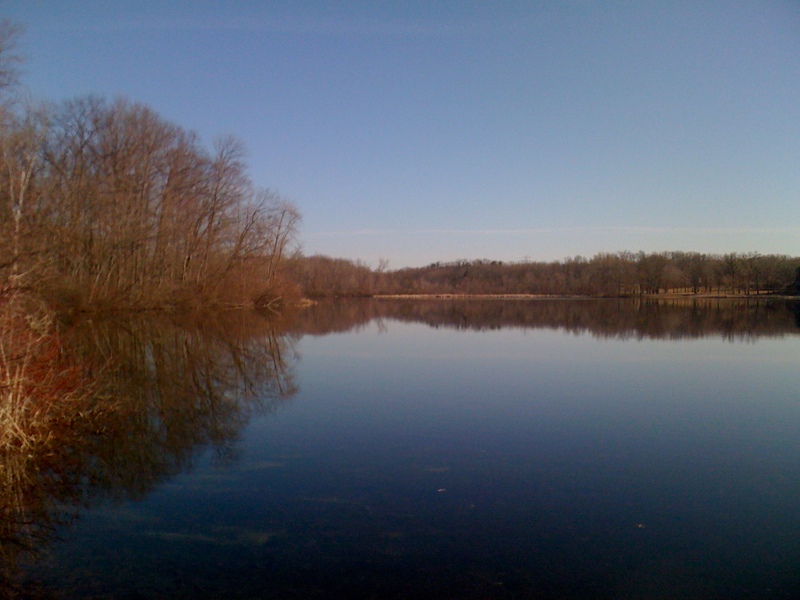 This is Long Lake in Northern Kent County. There are no motors allowed so it stays relatively calm. The shore line is fairly shallow so you can see a lot from out of a canoe or kayak. The fishing isn’t too bad either. There is a small launch on the West Shore and a nice Park on the East side. You can go way out into the deep woods and enjoy Nature but it isn’t necessary. I do recommend it to everyone, but one day trips to parks and nearby lakes can be awesome. It’s amazing what you can find. 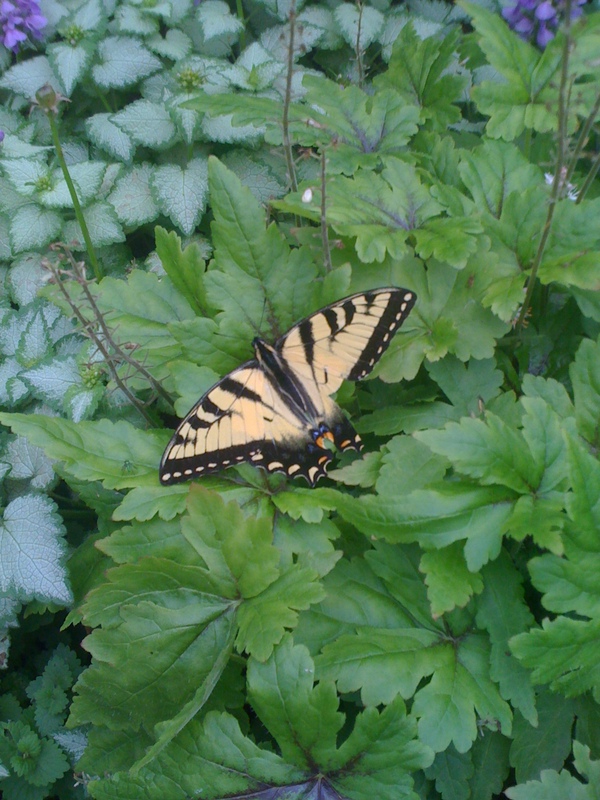 This Tiger Butterfly was very big. 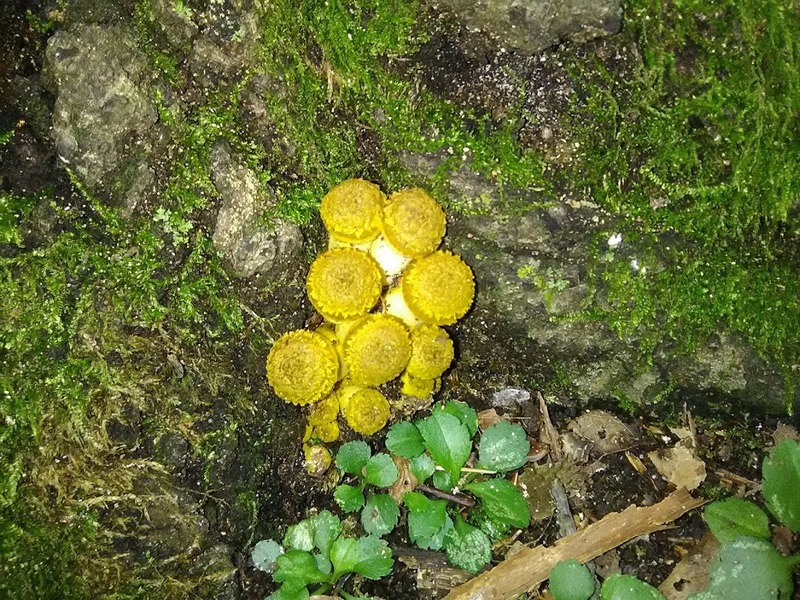 About 3″ across. Look close. You’ve heard the saying “stop and smell the Roses”. There is a lot of life that will pass you buy if you scurry around with a cell phone in your face. Put it away unless you are taking photos of cool things like this Tiger Butterfly. I haven’t been able to Identify the subspecies exactly though I believe it is either the Canadian or the Appalachian. If you know for sure, I would appreciate it if you dropped me a line on the Contact Page. Thanks. An Eastern American Toad. His name is Toe-D. 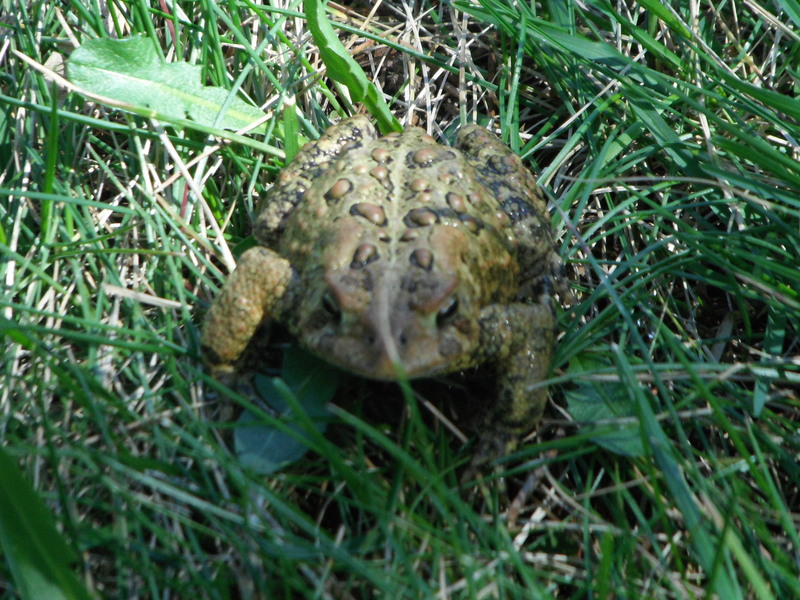 This Eastern American Toad (Anaxyrus americanus) is extremely beneficial. It will eat over 3000 insects in a year. Just let it be. Unfortunately. telling the kids to leave toads alone is like telling a pregnant woman not to eat M & Ms and Ice Cream (personal experience). The problem is that they excrete a poison (bufotoxin) from glands on their body. That poison is going to taste awful if the kids gets some in their mouths and if they rub their eyes and get some in. Wow does that burn (again, personal experience)!!! If the kids do manage to get some in their mouth make them rinse and spit numerous times. Don’t let them swallow. If the poison gets in their eyes, keep their eyes under the faucet and let lukewarm water flow into the eyes until the burning goes away. You should call the physician just as a precaution. The eyes will be red and swollen for a bit but it should go away. If your dog bites into and gets the poison in its mouth, it is in for a nasty time. The dog is going to foam at the mouth as though it has rabies. The poison can be a serious health risk to dogs, especially smaller ones if ingested. Gorgeous Lake Michigan Dunes near Saugatuck. My wife and I took this picture when on a dune ride in Saugatuck. It was a blast! Not only do you get a roller coaster ride through the dunes, but you also get a chance to get out and get some beautiful pictures. Not only that, but the drivers are quite knowledgeable about the dunes and happily part with some of their knowledge. Wild beast on the beach. Grandsons Aryn on left and Aidan on right. Just a hot summer day at the beech builds long lasting memories. Get the kids out of the house and outside. I put these picture in to show off my Grand Kids. I have 3 more and will find an excuse to put them in too. The little guy below is enjoying a day at Klackles which is an Apple Orchard West of Greenville. They have a ton of things to do. Check them out. We try to get out there every fall for Pumpkins and Apples. The wildest animal I know. 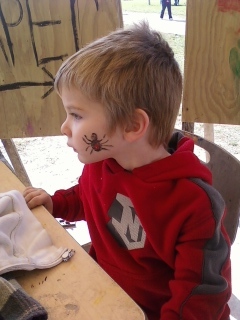 Grandson Shaun Avery. Aryn above is his big brother. 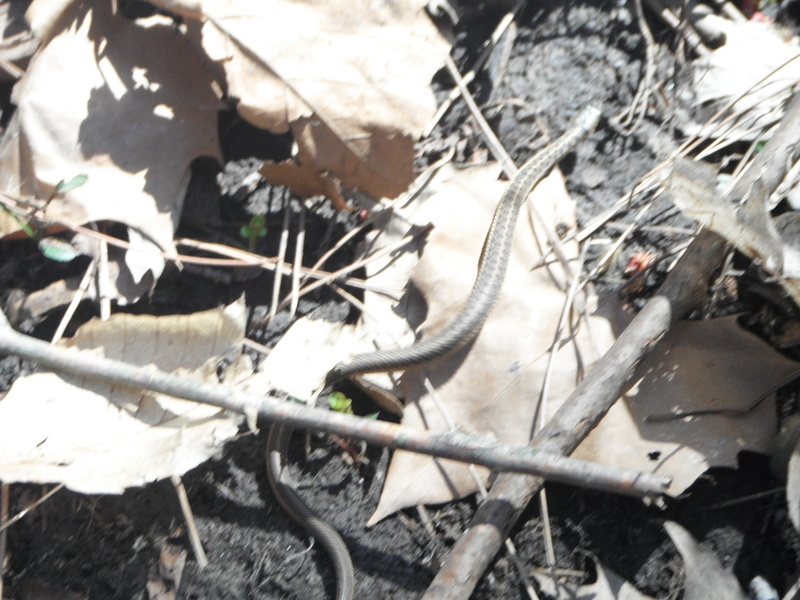 Common Garter Snake found by a river in West Michigan. The Garter Snake (Thamnophis), sometimes called a Gardener Snake (which is erroneous) is likely the most common snake in America. Harmless to people, Garters are quite often killed by people who “hate” snakes. Please don’t. Even a big one can’t seriously hurt you and they are very beneficial. If you do get bitten, wash the wound (they do have teeth) with soap and water. Unless you are one of the very rare people who are allergic to their saliva, that should be all you need to do. Wild Creeping Myrtle is a ground cover often used in yard-scapes. 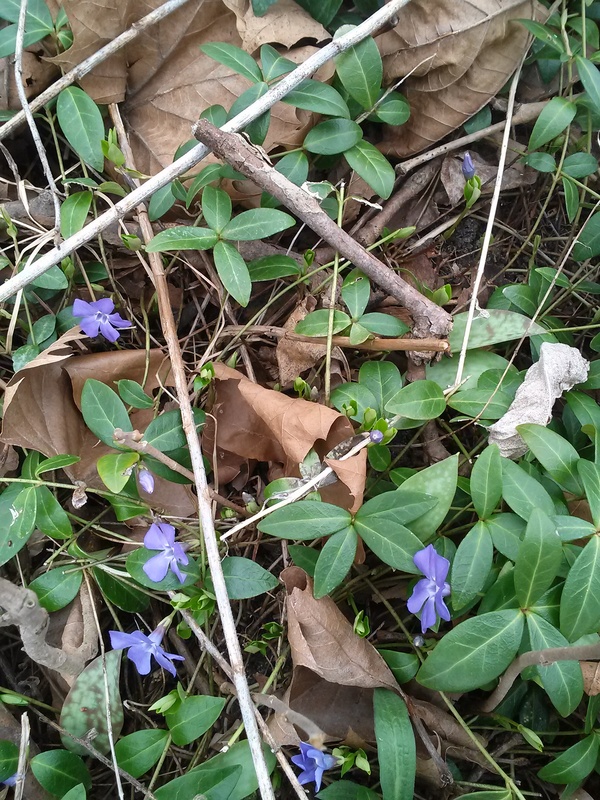 This Wild Creeping Myrtle (Vinca minor L.) has some history as being used as a spice, but I wouldn’t try it. It can be deadly poisonous. This is not an edible plant. The one thing that makes me a bit nervous is that it does have some similar characteristics of Wintergreen (see wild edible page). Mainly that they both have fairly succulent or thick waxy leaves. The Myrtle will also have lovely little purplish flowers when in bloom (see photo) which Wintergreen does not. Make sure you know the differences before harvesting Wintergreen just to be sure. Notice the blood coming out of a wound on this Blood Roots leaf. 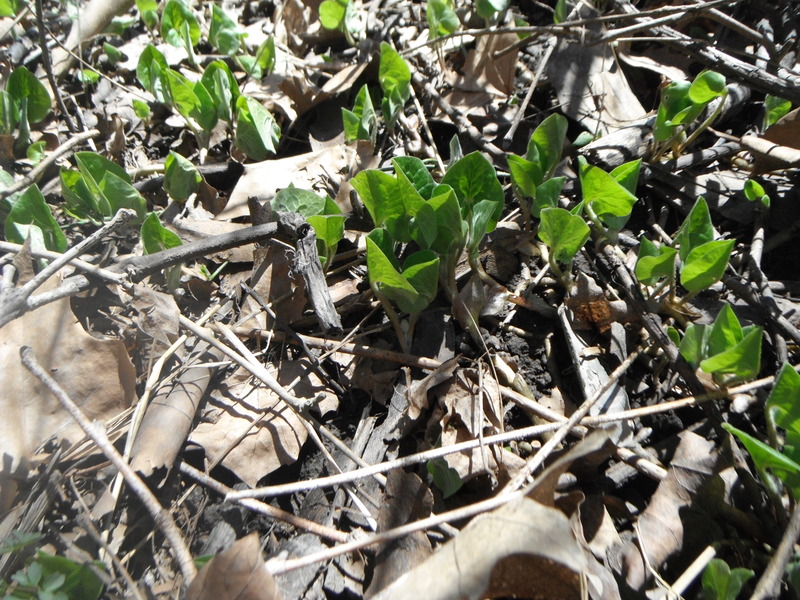 Wild Ginger in early Spring. Its leaves will become broad and heart shaped covering a single purplish blossom. I’m not going to add Eastern Wild Ginger (Asarum canadense) to the list of edibles because I don’t recommend eating this plant on a regular basis. Wild Ginger is not related to commercial domestic Ginger. Wild Ginger contains a chemical called Aristolochic acid which eaten in large quantities would be poisonous. I even mention this because you may find sources that will list Wild Ginger as an edible. The issue that I have is that I don’t know if it is stored in your body. In other words, would it build up and eventually reach toxic levels? Because this chemical does not dissolve well in water, I would say it stands a good chance of doing so. So I don’t recommend it as a part of your diet. But, the same logic does lend itself to it being used as a tea. Aristolochic acid does not dissolve well in water and the tea would have a minute amount in it. In other words, you would have to drink a lot of tea for it to be toxic. I will call it a non-edible. But I, as with any wild plant, will tell you to do your own research and decide for yourself. I personally will not use it internally. It does have some uses topically though that you may want to take note of. The roots boiled into a tea can be sprayed on yourself for an insecticide and an antiperspirant. Add the crushed roots to a sterile salve and use as an antiseptic. To wrap it up. There are many wild plants that are definitely edible that I don’t see a good reason to chance any border line plant and that includes Wild Ginger. But that doesn’t mean the plant doesn’t have good practical uses. 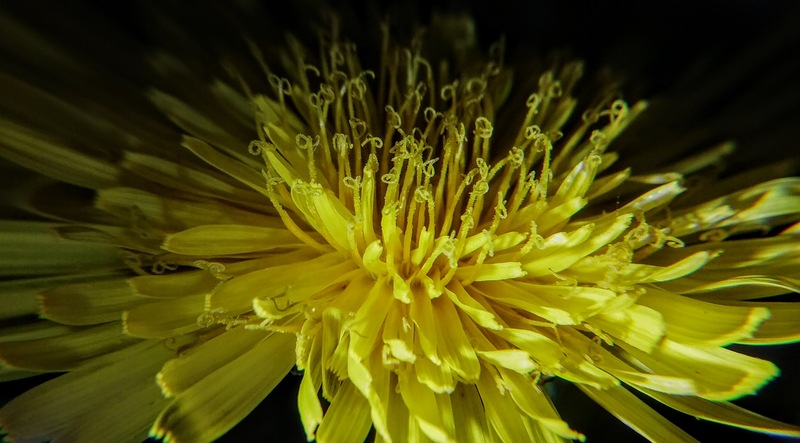 A beautiful Spring flower that can pack a punch. Best to leave it alone. 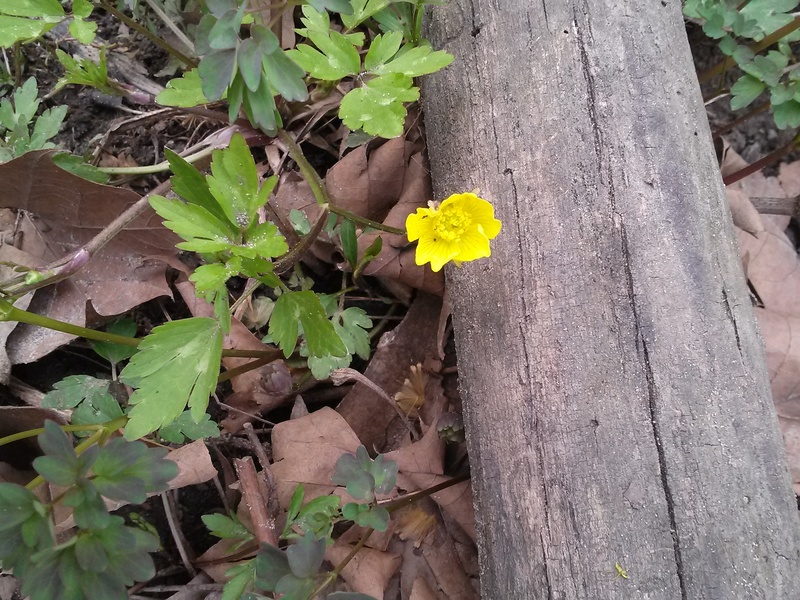 Enjoy the Creeping Buttercup (Ranunculus repens) without touching the plant. The plant is extremely poisonous so you don’t want to get any in your mouth. Beyond that, the sap can also blister your skin, so this is a really good plant to admire with out touching. 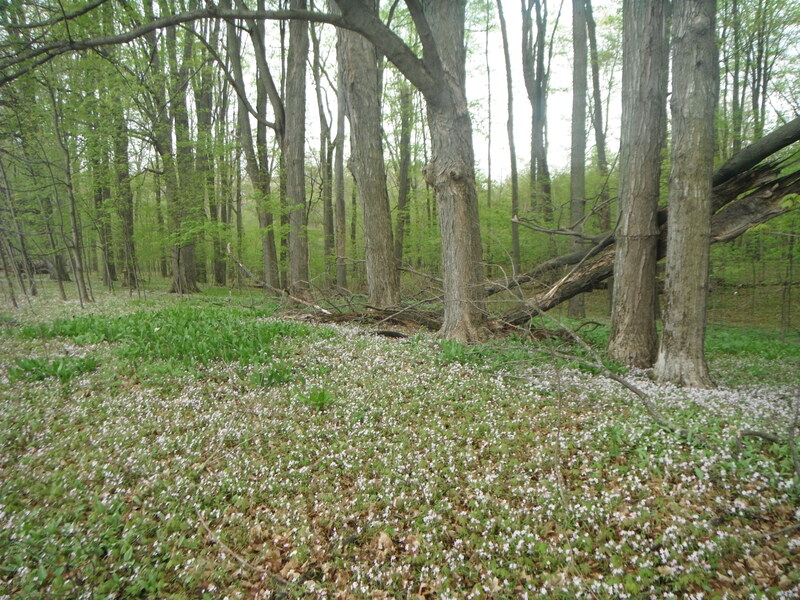 It can usually be found in moist rich soils and blooms in April/May here in Michigan. They are quite pretty despite their nasty effects if you pick them. Livestock will typically not eat this plant because it burns their mouth and taste acrid. If they do eat it, it can cause serious issues. Thankfully, the effects dissipate when it is dried, so that when it is baled with hay, it won’t hurt livestock. It’s amazing how God works everything out. Can you imagine the issues it would cause if it remained toxic when dried in hay? 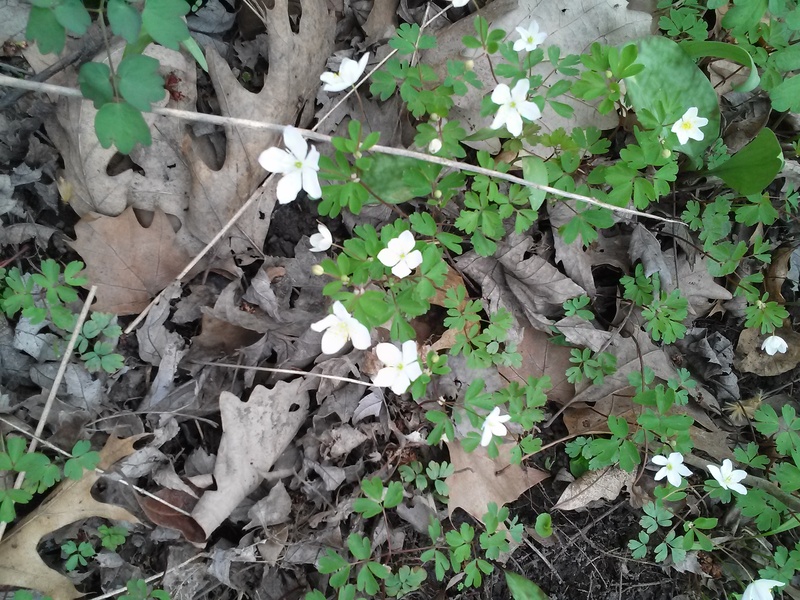 In the same family as Buttercup, False Rue Anemone anem·o·ne (Enemion biternatum) is only around for you to enjoy in April and May. Once it is done blooming for the Spring, the above ground part dies off. The fruit is a star shaped seed pod. W e know that this is a False Rue Anemone because it always has 5 petals whereas true Rue Anemone may have more. I’m having a hard time finding information on the toxicity of this plant, but it is a member of the Buttercup, which we know is poisonous. I definitely will not be adding this little gem to a salad. You can find it near stream beds where deciduous trees are present. Another Anemone of early Spring is the Round-lobed Hepatica (Anemone americana). 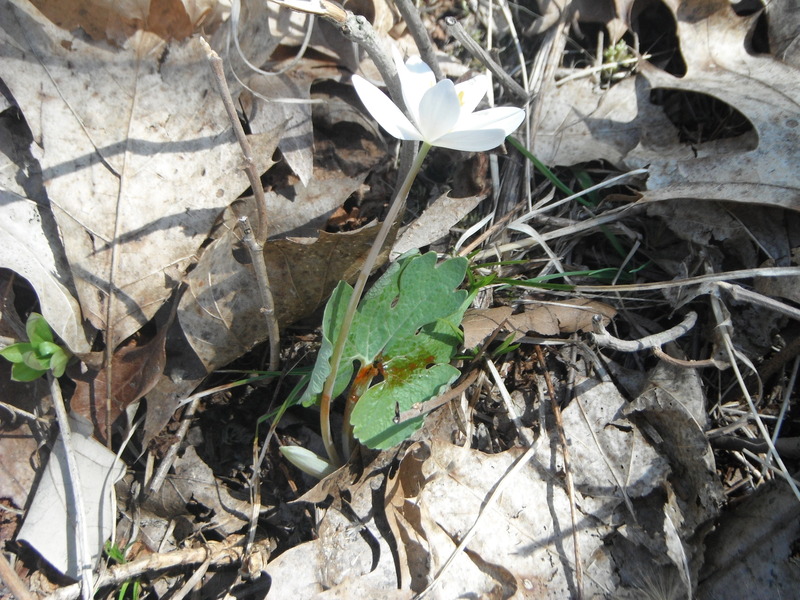 This is also a very early Spring bloomer. 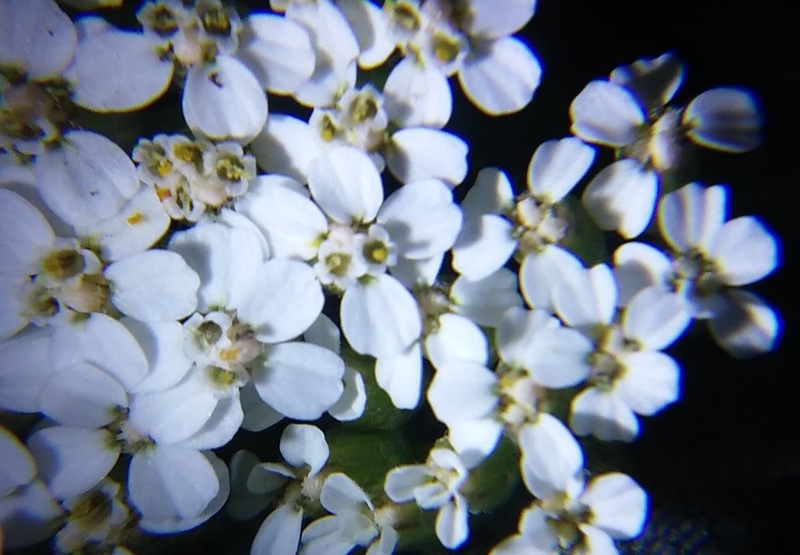 The ones in the photo were intermingled with Spring Beauties, which is why it is important to pay close attention to what you are looking at. Spring Beauty’s always have 5 petals. Round-lobed Hepatica has a variety of petal counts but the vast majority have 6 petals. The leaf systems are totally different. 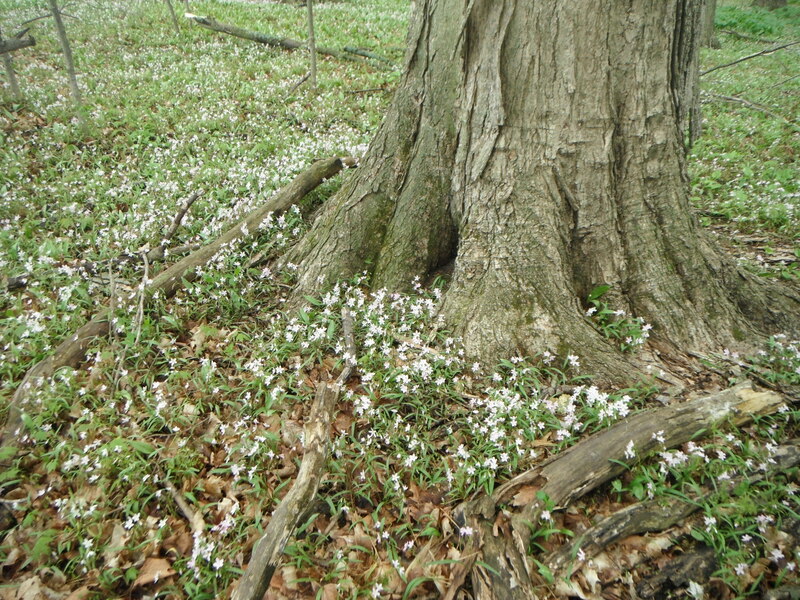 Spring Beauty have long narrow grass like leaves and the Round-lobed Hepatica has hairy, broad leaves and a hairy stem. It is very important to know the difference because the Spring Beauty is completely edible while the Round-lobed Hepatica is not. It has been Historically used as a treatment for Liver ailments, but there isn’t enough evidence for me to support its use. 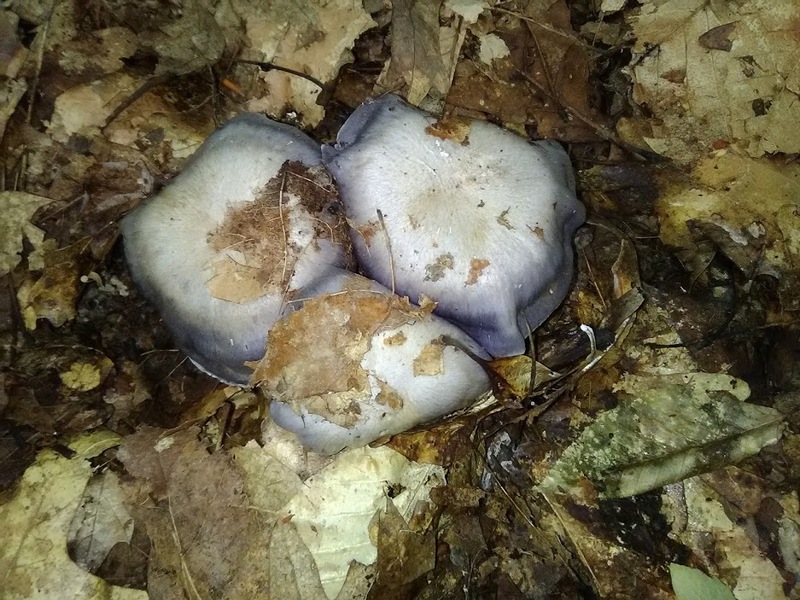 It is not drop dead poisonous so if you accidentally get one mixed in with your Spring Beauty harvest you are likely going to be fine, but eat too much of it and you won’t be happy. 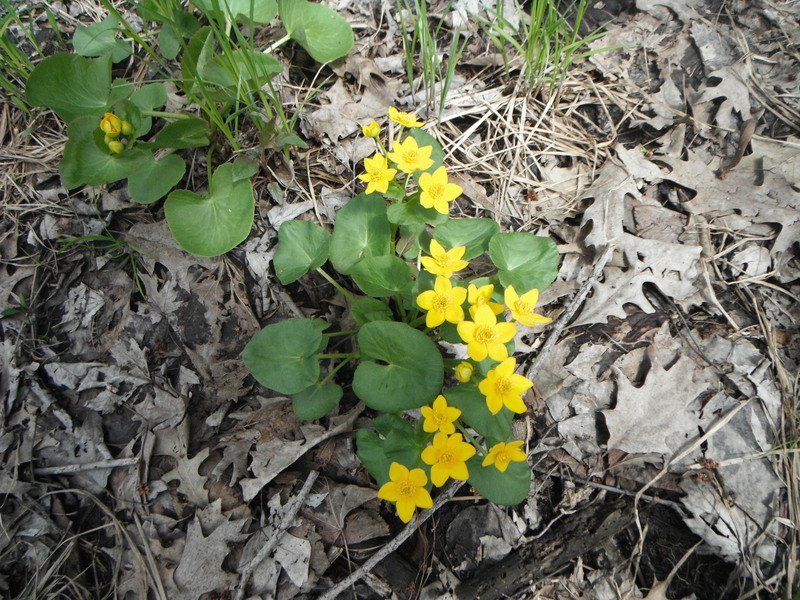 The Marsh Marigold blooms look like Buttercup, but the leaves are different. 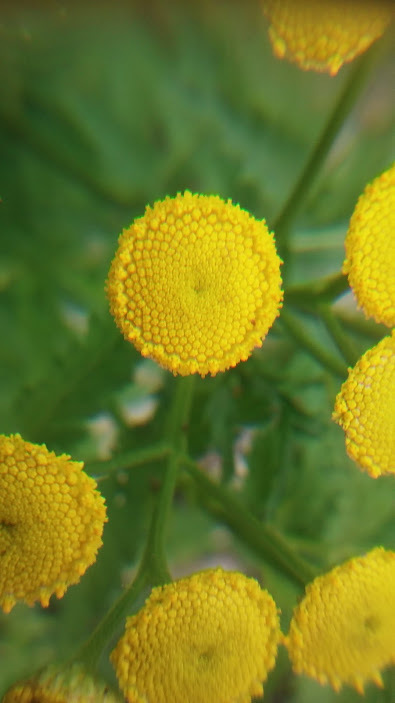 They are in the Buttercup family. The Marsh Marigold (Caltha palustris) is not a Marigold at all but is rather in the Buttercup family. They are much bigger than your typical Buttercup and the leaf pattern is considerably different as well. 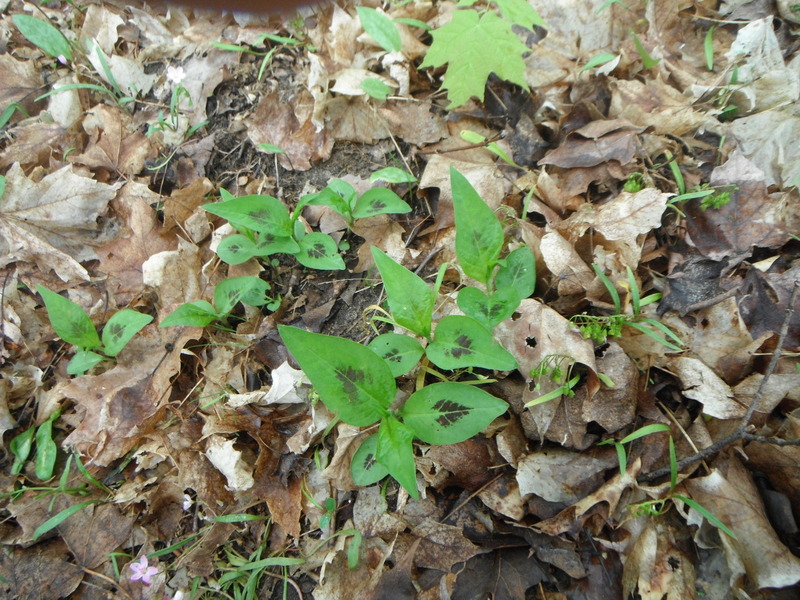 The plant’s leaves can be boiled and eaten and the flower bud can be pickled. 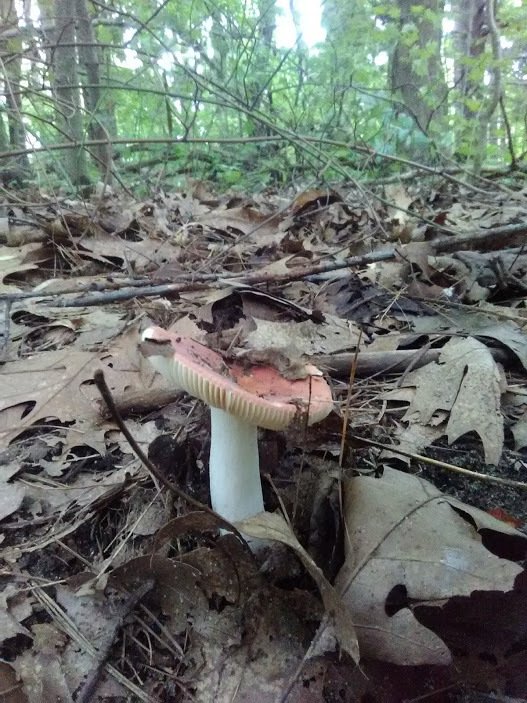 I won’t add it as an edible because it is too poisonous raw. It was a real border liner for me. If worse came to worse, you could consume it but, I would rather my readers not take any chances and just remember it as non edible. The thing is, there are plenty of other edibles available typically, when the Marsh Marigold is available. Edibles that pose no risk at all. It is quite beautiful and that’s enough for us to love this plant. 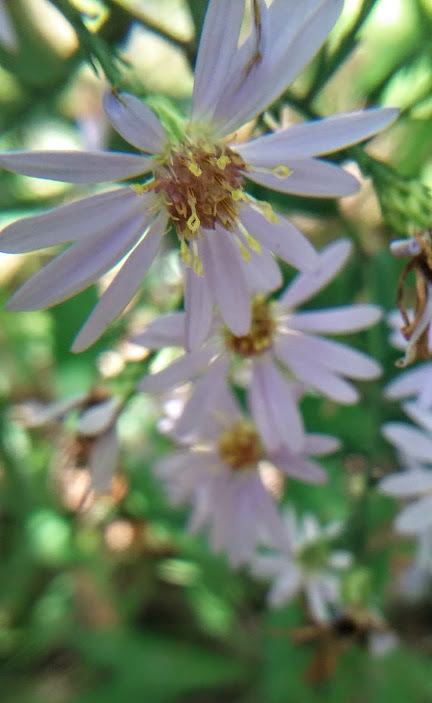 You will find it in Marshy areas and it blooms early when the weather isn’t so hot that you cant enjoy it. Look for it in late April into June in Michigan. Note the grey shadow un its underbelly. That is what identifies it as a Midland sub species. Here is another Michigan Turtle to enjoy. The Common Painted. 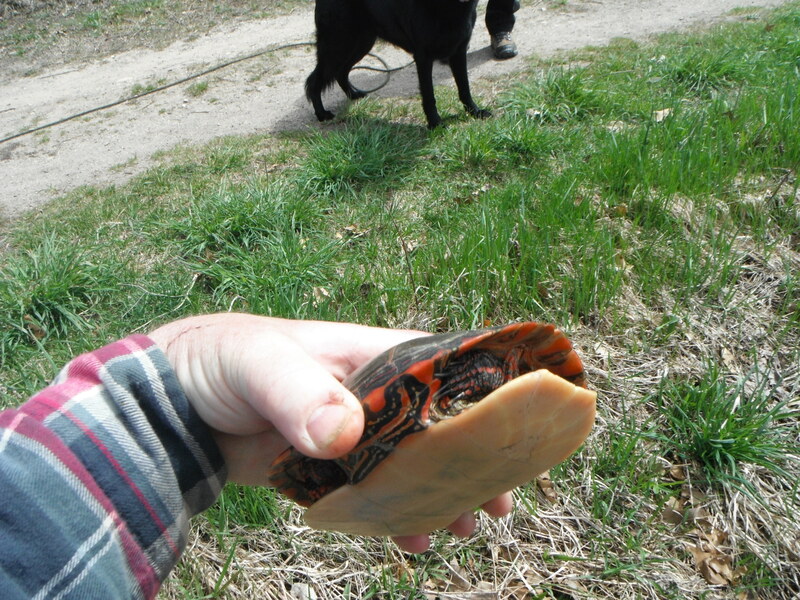 In this case the sub species, Midland Painted Turtle (Chrysemys picta marginata) . The Midland is most often found in the Great Lakes Region. You can identify this subspecies by noting the dark shadow on its under shell. This is a very pretty, placid, water turtle that doesn’t get very big and is no threat to anyone, except maybe water bugs and other insects. This one was on shore and very easy to pick up, so I didn’t stress it any. I held it just long enough to get a picture of its underbelly so that I could get positive I.D.. Typically, I just enjoy watching them on logs sun bathing. It is the most common Turtle in North America, so the opportunity to view them is pretty numerous. 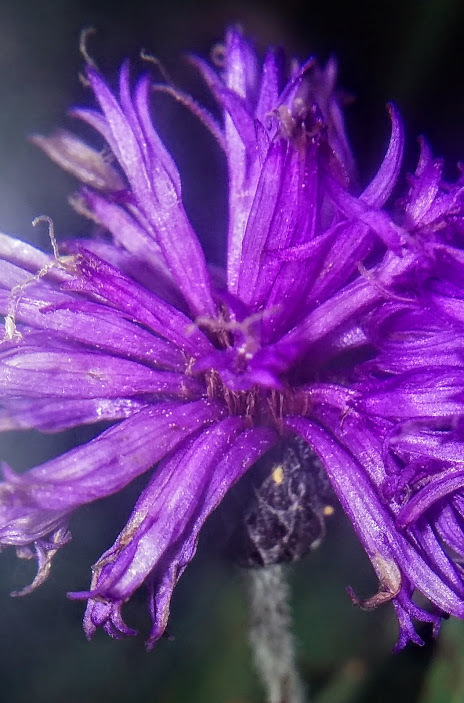 Here is the prettiest and sassiest little wild flower there is. 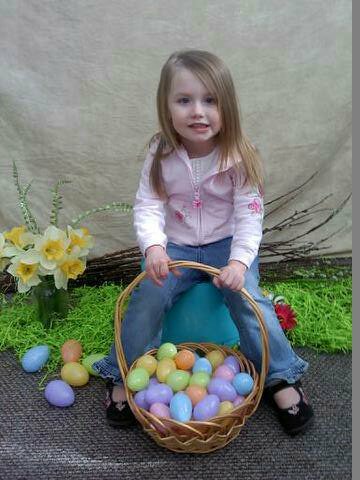 My grand daughter Nouvelle. I am a bit biased. 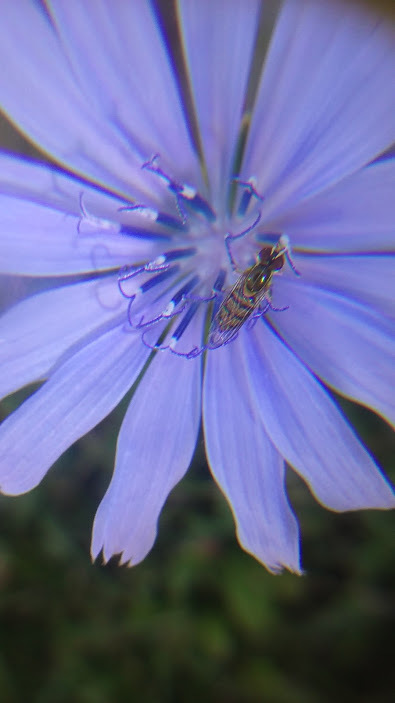 She is native to Michigan, but seems to have spread to the North West Minnesota area. That’s her big brother Aidan in the previous picture. This picture was taken 5/8/15. I have no idea what it is and have searched a lot of data bases trying to find it. It has a very interesting variegated leaf. 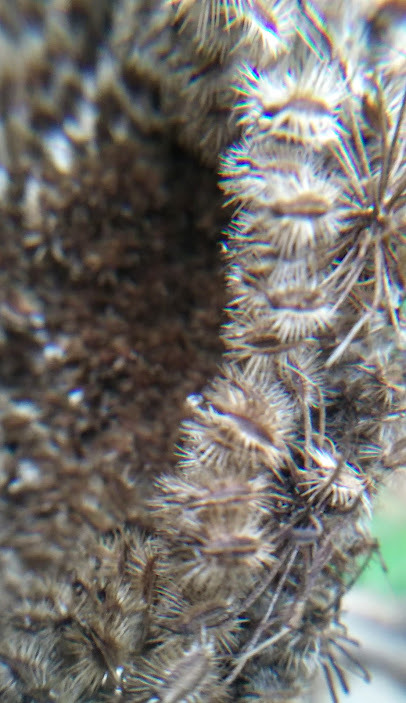 If you have any idea what this is I would appreciate it if you let me know. Just use the contact page. 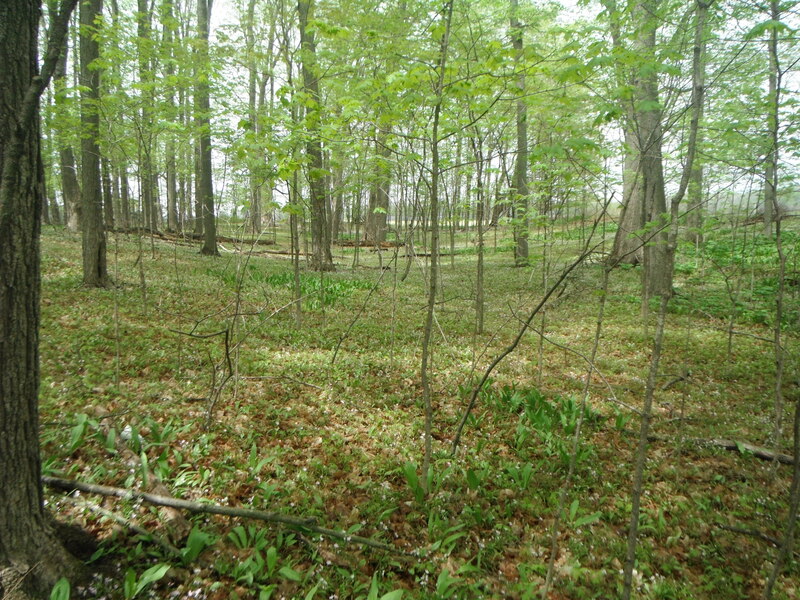 Located in an older growth deciduous forest among Spring Beauties. Very cool. This plant is one of two. 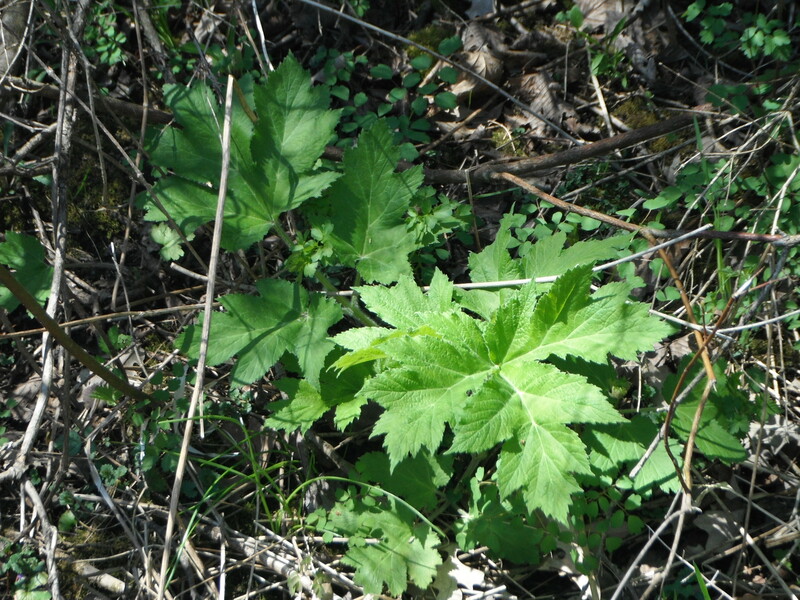 The more likely being Cow Parsnip (Heracleum lanatum) but there is a possibility that it is Giant Hogweed (Heracleum mantegazzianum). Here’s hoping its Parsnip. Hogweed would be an evasive plant. There are some non-confirmed reports of it in Michigan. At this stage they are very similar. I will check on it later in the summer for better identification. As I mentioned, chances are much higher that it is Cow Parsnip. Cow Parsnip can be a major irritant to some. Especially if the sap is on the skin and the sun shines on it activating a chemical reaction that can cause rashes. The Giant Hogweed is straight up poisonous. The following is one of the many reasons to take some time in the woods. 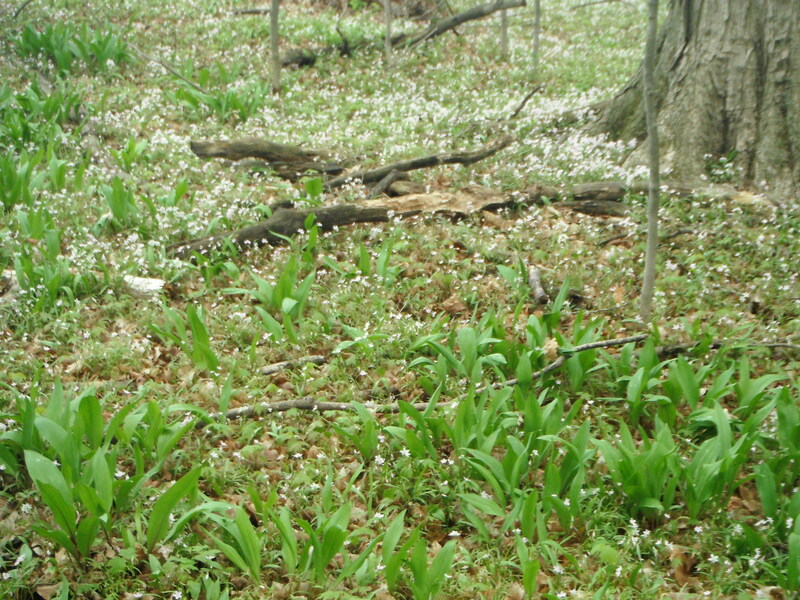 The Spring Beauties virtually carpet the forest floor in a fairyland like fantasy. Notice the Wild Leeks. There were an abundance of them in patches. Thousands of them. What a valuable find-right. I’ll harvest what I need but leave the rest. They have been there for many years and will remain as far as I’m concerned. great pics. glad the snake pic turned out wasnt sure if you got that one or not. I wanted to construct a brief note so as to appreciate you for all of the remarkable secrets you are writing on this site. My extensive internet lookup has at the end been paid with pleasant details to write about with my pals. I would assume that we readers actually are definitely fortunate to dwell in a fabulous website with very many special people with useful opinions. I feel extremely happy to have seen the webpage and look forward to so many more pleasurable minutes reading here. Thanks a lot again for all the details. Thank you for the kind words. Keep an eye on the website for new articles.